On Saturday 22 September 2018, just over eighty persons joined the Federation’s Embassy in Havana to celebrate the 35th Anniversary of Independence of St. Kitts and Nevis at Villa Cuquine. 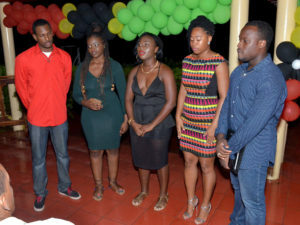 St. Kitts and Nevis’ students from the different provinces in Cuba travelled to Havana to participate in two full days of activities culminating in an official ceremony, cultural performances and a dinner. The student’s party, which would have succeeded the dinner, was eventually cancelled because of the two days of national mourning decreed by Cuba following the death of the President of Viet Nam, Tran Dai Quang. 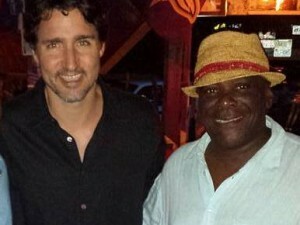 The Federation’s Ambassador to the Republic of Cuba, H.E. Verna Mills delivered a message on behalf of the Embassy under extreme weather conditions that resulted in a power outage for over two hours. 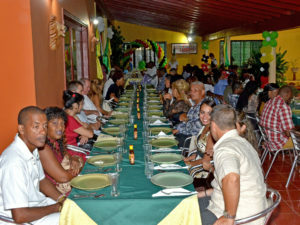 Apart from students and Cuban officials from the Ministry of Foreign Affairs, invitees also included members of the Diplomatic Corps, Cubans of St. Kitts and Nevis descent, Embassy Staff and Cuban friends and well-wishers. In spite of the torrential rains, thunder and lightning storm and the power outage, the students, descendants and invited guests commended the Embassy for an outstanding activity. On the morning of Sunday, 23 September 2018, the students departed for their respective universities.